I've had everything to stitch up Lizzie Kate's "My To Do List" for almost a year, but crafting (especially stitching) fell by the wayside for a while. I finally got the stitching bug back, and I'm really happy about it. This is going to be a birthday present for my mom. I bought a barn wood frame for it, but I haven't had a chance to frame it yet. This is so wonderful! Your stitching is so neat and clean. The saying and the work is just beautiful! 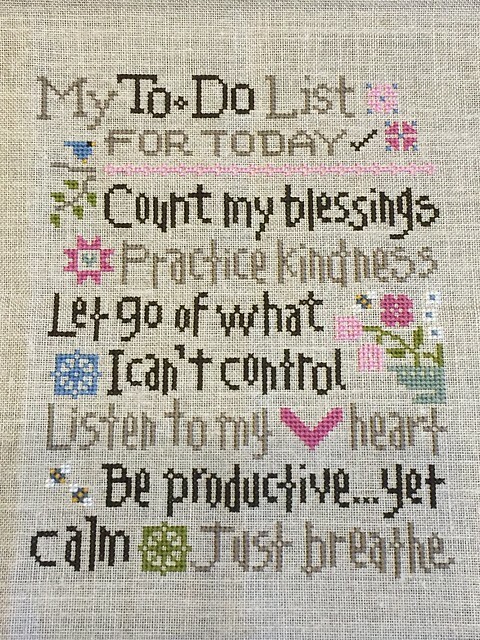 What a great idea to stitch up a list. The lettering is super fun! I have a soft spot in my heart for samplers. This one is beautiful. It does not look counted cross stitch, as it appears to be on linen? Please share how you transferred the pattern? I have not been doing as much hand stitching as I would like to, either. But this is just wonderful. I love all the little quilty 'do dads' that are part of the pattern. And I love your thread color choices. stillatthetop - Thanks! It's counted cross stitch on linen. I just stitched it like I would on Aida except stitching over two threads. It definitely makes the counting a little harder in the gaps, but I love the way cross stitch looks on evenweave and linen. There are a few mistakes/changes from the pattern, but they aren't really noticeable.